It’s time to look at what’s in store for the week ahead! We’ve had plenty of sunshine over the past week, but temperatures have remained on the chilly side. It’s time to look at what’s in store for the week ahead! We’ve had plenty of sunshine over the past week, but temperatures have remained on the chilly side. 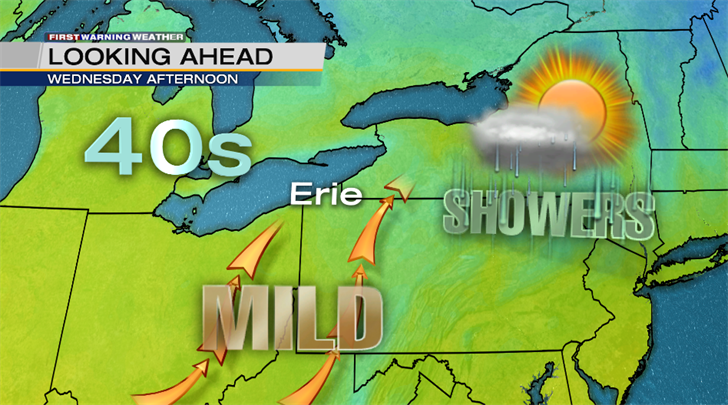 In the next couple of weeks, that will begin to change and we’ll start having some milder air move into the region. Before we get ahead of ourselves and look too far into the future, we have to get through this week, which features a little bit of everything. We’ll begin the week with some chilly air and abundant sunshine, transition to some rain and snow on Wednesday and Thursday, and then return to sunny weather for the weekend. Let’s investigate. High pressure will be directly overhead to begin the week. Many meteorologists throw out the term, “high pressure,” on-air, but fail to explain what it actually means. High pressure is responsible for pleasant weather. It causes the air thousands of feet above our heads to sink down to the surface. As the air sinks, it is very difficult for the atmosphere to generate precipitation. That’s why many meteorologists say that high pressure means happy weather! A cold front will approach from the West on Wednesday, creating some chances for rain showers on Wednesday afternoon, which will transition to snow showers on Thursday as colder air funnels in from the North. 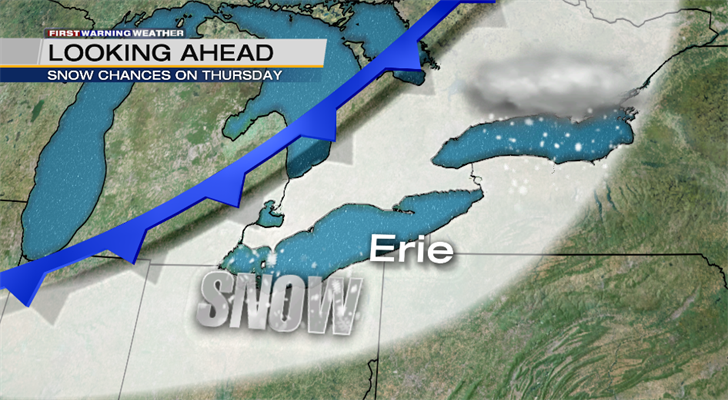 We’re only expecting a light snow event on Thursday. Right now, we aren’t expecting anything major. At most, some areas may get a quick inch or two of snow, which will quickly melt on Friday as the clouds clear out and the sun returns in full force. 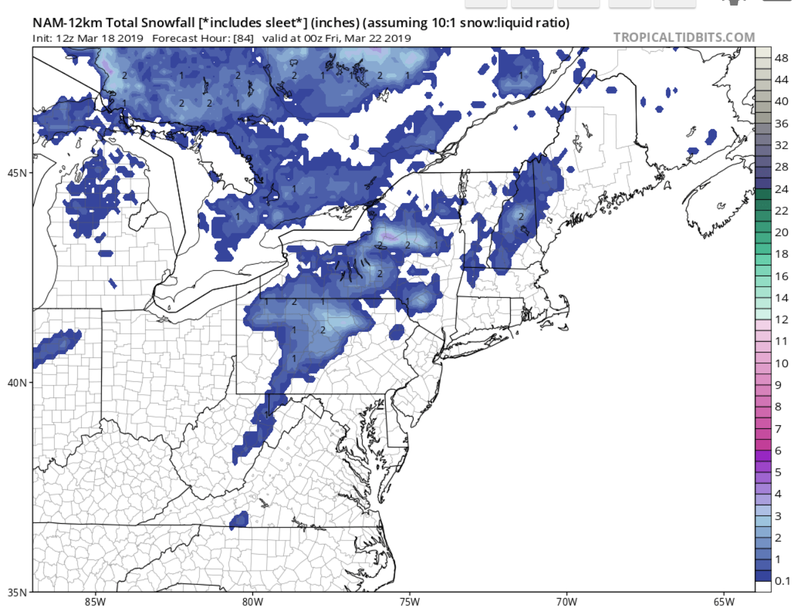 General computer model consensus agrees that we won’t be seeing much snow accumulation this week. 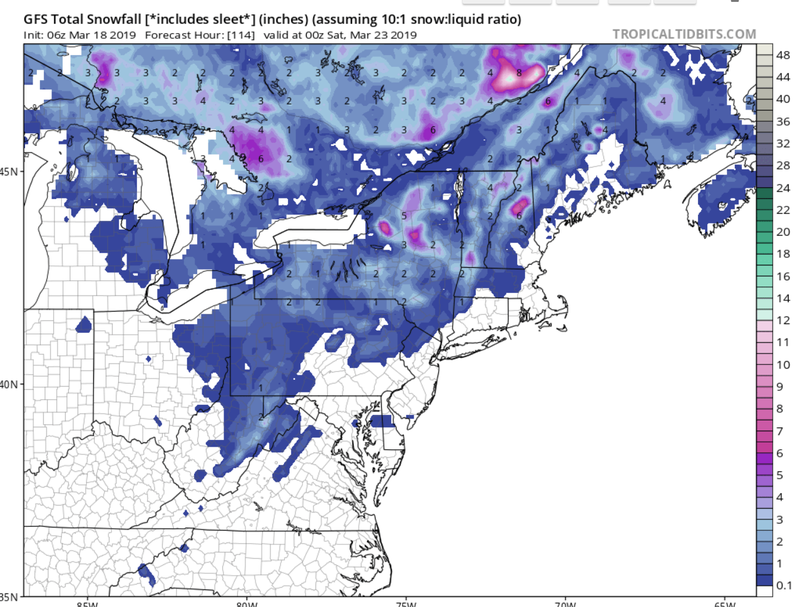 Below are two model predictions of accumulated snowfall through Friday morning (courtesy of tropicaltidbits.com). The top image is the American (GFS) computer model, which shows no more than an inch of snow across our region. The bottom image is the North American Mesoscale (NAM) computer model, which shows even less. The NAM shows almost nothing along the lakeshore, with areas south of interstate 90 getting up to an inch of snow. We will keep an eye on everything and update you if something changes. Speaking of snow, here’s how this Winter compares to the previous two Winter seasons. 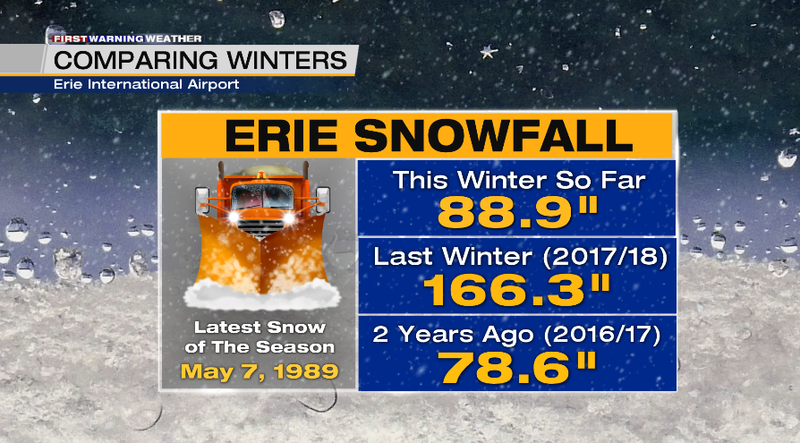 So far this year, we’ve had 88.9 inches of snow at Erie International Airport. Last year was a monster year for snow totals, officially reaching 166.3 inches! Two years ago was a below normal year for snowfall, with a total of 78.6 inches. The average annual snowfall for Erie International Airport is 100.9 inches. So far this year, we’ve had below normal snowfall, but it’s still more than what we saw two years ago. We didn’t even come close to the amount of snow we had last year! Over the next few weeks, we’ll see if we can add onto those snow totals, or if Old Man Winter has decided to call it quits for this year. You never know... the latest snow on record was on May 7th, 1989! This weekend, temperatures will rebound and it will begin to feel more like Spring around here. Below is the Climate Prediction Center’s 6-10 day temperature outlook. Areas in yellow, orange, and red have a greater chance of seeing above average temperatures. Let’s keep our fingers crossed that we’ll see warmer weather more consistently around here! I’ll leave you with one last warm thought. Spring officially arrives on Wednesday, March 20th at 5:58pm!